We are HMO Approved | What does it mean? HMO- What does it mean? You may have heard the term HMO approved accommodation before? It literally means House in Multiple Occupation. What this means is that the property is licenced to hold multiple individuals all at once. The entire house or flat which is let to 3 or more occupants who make up 2 or more households that share a kitchen bathroom or toilet. This applies to houses that have been converted into bedsits or other non-self contained accommodation. Basically, two or more parties (unrelated people) who hold two separate tenancy agreements can live in the same living space. That is why many student accommodation blocks must have a HMO licence. 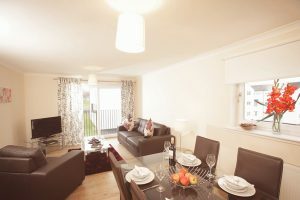 Our accommodation is several buildings which are created as self-contained flats that hold between 3 or 4 occupants. Dockyard Digs has an HMO licence for its properties and this is perfect for migrant workers who will be using the property as their main residence while they are working in the UK. We offer short and long-term tenancy agreements which can cater for a worker coming to the UK for a few weeks or months. A HMO licence makes it very easy for companies to house their workers & employees while they are away from home. Due to the fact that 3 or more unrelated occupants can share the same living space, a company can fill a few apartments with workers from all over the world. Our Accommodation has been designed to create a home away from home for workers, holidaymakers & everyone in between. The flexibility of an HMO licenced property means that it can be used as a short-term home for almost any reason. We can house a family or a party of friends for golf trips to tourists driving all around Scotland. Check out our HMO approved accommodation by clicking on the picture.